The clotted cream was dolloped on top of the 40+ scones I made for friends at my birthday tea party upon returning to Aarhus. The rhubarb was transformed into a breakfast crumble with apples and blueberries. The tea was subsumed into my ludicrous collection which now encompasses four shelves and is divided between home and office. The nuts (which are insanely expensive over in Denmark, around £8 for a small box of pistachios) are in my larder, ready for baking adventures. The quinoa (on offer in M&S, and always good to have around) became a lovely nutty salad with shockingly purple roasted beetroot and crumbled feta. The panettone I stole from my parents’ stash of Christmas gifts because I wanted to make this. It’s not exactly rocket science. Douse some thick slices of soft, fluffy panettone in a vanilla-scented custard. Fry in hot, foaming butter on both sides until golden and slightly crisp on the outside, while collapsing into clouds of tender custard within. Dust with icing sugar for snowy prettiness. 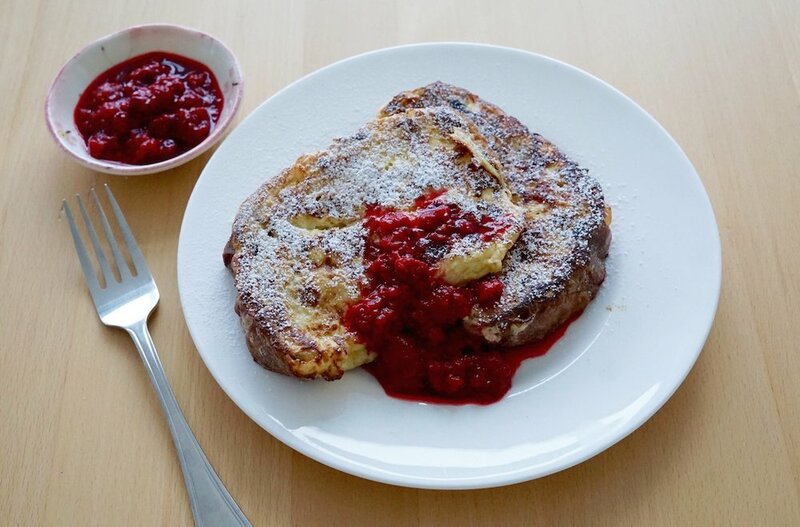 Serve with a mouth-puckeringly tart raspberry compote to take the edge off all that richness. Preferably for Sunday brunch. It’s ludicrously delicious, intensely satisfying, and would be good with any form of brioche loaf. You could also swap the raspberries for other favourite berries – it just needs to be tart and sharp. Optional accompaniment: a feeling of smug fulfilment that you defied your mother’s expectations in managing to fly home with a whole panettone on top of everything else stuffed into your bursting-at-the-seams suitcases. Now she will understand my determination. First, prepare the raspberry compote. Put the berries in a small saucepan with the lime juice and sugar and cook over a medium heat until the berries start to release their juices. Set aside. Whisk together the eggs, crème fraiche, vanilla, milk and salt in a shallow dish. Place the slices of panettone in the dish, and leave for a couple of minutes to soak up the mixture before flipping them to allow the other side to soak. Heat the butter over a medium-high heat in a large non-stick frying pan. When the panettone is doused in custard, transfer it to the frying pan. Cook for a couple of minutes on each side until golden brown (you may need to do this in batches depending on the size of your pan - keep the cooked slices warm in a low oven, if so). Divide the panettone between two plates and dust with icing sugar. Serve with a dollop of the raspberry compote, and a spoonful of crème fraiche if you really want to gild the lily.